These bleach-free, pre-moistened wipes clean and disinfect in one step. 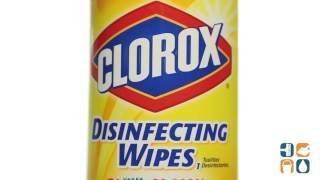 Clorox Disinfecting Wipes kill 99.9% of bacteria, including staph and salmonella. Also kills cold and flu viruses quickly. These powerful wipes work on hard, nonporous surfaces and are ideal for day care centers, offices, schools and restaurants. Each wipe is 7" x 8" in size and there are 35 wipes per canister. Includes one canister. Call today to order. Stock up and save more!